English political economist; born in Ancona, Italy, in 1821; died in London May 7, 1888. Levi went to England at an early age, was converted to Christianity, and became a member of the English bar (1859). He devoted much time and energy to the organizing of chambers of commerce. In 1850 he published his "Commercial Law of the World"; in 1852 he was appointed to the chair of commercial law in King's College, London. Levi was an active member of the council of the Royal Statistical Society, and contributed to its journal many papers bearing on the industrial occupations of the people. In 1887 he attended the congress of European statisticians at Rome. It was owing to Levi's suggestion of the benefits which would result from the possession of an international commercial code that the acts were passed (1858) whereby the mercantile laws of the United Kingdom were made uniform on many points. 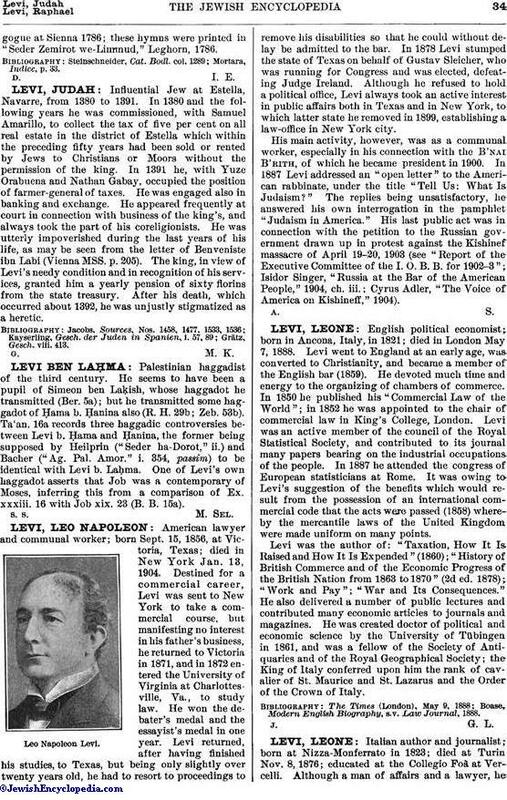 Levi was the author of: "Taxation, How It Is Raised and How It Is Expended" (1860); "History of British Commerce and of the Economic Progress of the British Nation from 1863 to 1870" (2d ed. 1878); "Work and Pay"; "War and Its Consequences." He also delivered a number of public lectures and contributed many economic articles to journals and magazines. He was created doctor of political and economic science by the University of Tübingen in 1861, and was a fellow of the Society of Antiquaries and of the Royal Geographical Society; the King of Italy conferred upon him the rank of cavalier of St. Maurice and St. Lazarus and the Order of the Crown of Italy. Boase, Modern English Biography, s.v. Law Journal, 1888.